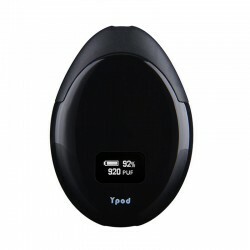 The Original Yosta Ypod Kit is an ultra-compact pod system kit with 500mAh built-in battery and 2ml e-jucie capacity. With draw activated design, you can just take a puff without any button. It is designed with top airflow holes which avoid leakage problems completely. It is equipped with a 0.49 OLED screen to show vaping status including power, puffs and vaping time. It also adopts 1.4ohm Ceramic Coil for healthier and purer taste. This item also has other colors to choose.